If you are looking for improvement in your appearance and a more balanced profile, you may find chin enhancement / augmentation the plastic surgery procedure for you.. Surgeons who specialize in rhinoplasty/nosejobs, or surgery of the nose, are the first to suggest that changes in chin size or shape. It is common for the facial plastic surgeon to recommend chin surgery in addition to nose surgery when the surgeon sees that chin augmentation is critical to achieve facial balance. Chin enhancement / augmentation is a relatively simple procedure that can make a major difference. There are several methods used to achieve the desired results. If you are wondering how chin surgery could improve your appearance, you need to know what to expect from this procedure. 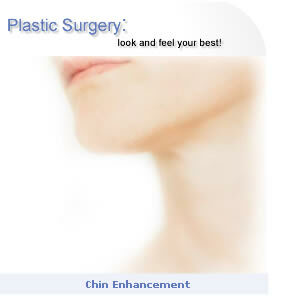 SSI will provide you the information to begin considering chin surgery. Fat Grafting- The surgeon will take fat from a donor area such as the abdomen or inner thigh. Small amounts are than injected into tiny tunnels, cross-layered and structured to form a stable platform to augment or fill the chin area. Chin Implant- A small prosthesis is implanted in the chin through a small incision below the chin. To augment the chin, the surgeon begins by making an incision either in the natural crease line just under the chin or inside the mouth, where gum and lower lip meet. The surgeon creates a space where an implant can be inserted. This implant, is made of synthetic material that feels much like your natural tissue found in the chin, is available in a large variety of sizes and shapes. This allows custom fitting of the implant to the needs of the patient's face. After implantation, the surgeon uses fine sutures to close the incision. When the incision is inside the mouth, no scarring is visible. If the incision is placed under the chin, the scar is usually imperceptible. Chin Reconstruction- A more invasive surgery with a longer recovery time, however this surgery is the best option for some and has the most natural and permanent results. What to expect after chin surgery- Immediately after surgery, the surgeon usually applies a dressing that will remain in place for two to three days. You will experience some tenderness. Post-operative discomfort can be controlled with prescribed medications. Chewing will be limited immediately after chin surgery, and a liquid and soft food diet will be required for a few days after surgery. Most patients feel a stretching sensation after chin enhancement surgery, this usually subsides in a few days. Chin enhancement / augmentation is often an addition to other facial procedures. For example, during a facelift, a patient may have implants placed on the chin to compliment other plastic surgery procedures such as a nose job (Rhinoplasty), and liposuction of the neck.